Welcome to Bear’s First Birthday Bash! 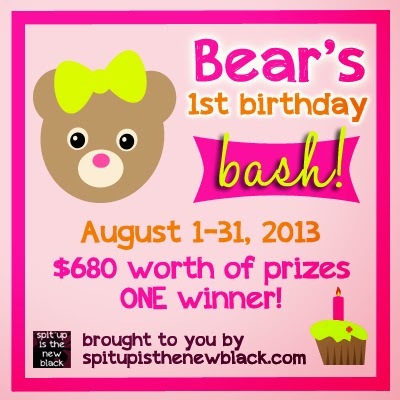 Ashley over at Spit Up is the New Black is celebrating that big mom milestone – her little Bear is turning one this month! To celebrate, she’s gathered together a group of amazing brands that offer wonderful products perfect to kick start a little one’s special second year (where did the first year go?!). I am so excited to be partnering with her to offer one lucky reader a prize suite valued at $680! ONE lucky winner will win ALL of the items listed above! To enter to win this suite of prizes, please use the Rafflecopter below. Open to residents of the contiguous US states, ages 18+. Giveaway closes 8/31/13 at 11:59PM ET. Good luck!